Sky Sports has said off-air remarks made by two football presenters about female assistant referee Sian Massey were "not acceptable". Host Richard Keys and pundit Andy Gray commented on Ms Massey's appointment for the game between Wolves and Liverpool on Saturday. 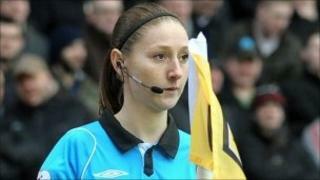 Believing their microphones were off, the pair agreed female officials "don't know the offside rule". In a statement, Sky said the two men had apologised for the comments. The Football Association has given its support to Ms Massey, 25, who made a correct borderline call in the build-up to Liverpool's first goal at the Molineux stadium in Wolverhampton. Speaking ahead of the match, Mr Keys said "somebody better get down there and explain offside to her" and Mr Gray remarked "women don't know the offside rule". How prevalent is sexism in sport? Mr Keys then said "of course they don't", before adding: "I can guarantee you there'll be a big one today. [Liverpool manager] Kenny [Dalglish] will go potty." He then went on to remark on comments made by West Ham vice-chairman Karren Brady in the Sun newspaper on Saturday morning about the level of sexism in football. "See charming Karren Brady this morning complaining about sexism? Yeah. Do me a favour, love," he said. Sky said: "The comments are not acceptable. They were not made on air but we have spoken to Richard and Andy and told them our views and they have apologised and expressed their regret." An FA statement said it had made "real strides in encouraging both male and female match officials to enter the game at every level, and will continue to offer every encouragement to all officials within the football family to progress to the highest levels possible". "We are proud to have some of the world's best match officials, both male and female. "Overall the number of female referees in England (Levels 1-8) stands at 853 and climbing, and all of our female match officials act as fantastic ambassadors for the game. "They have our wholehearted and continuing support," it said. Referees body Professional Game Match Officials issued a statement from their general manager Mike Riley. It said: "All PGMO referees and assistant referees are appointed on merit and ability. They are assessed on their performances only." Former executive deputy chairman of Millwall Football Club Heather Rabbatts told BBC Radio 5 live the game needed more female officials. "But when they're appointed, sadly, they'll get the same abuse as their male colleagues."